Standard 8 mm film, also known as Regular 8 mm film, Double 8 mm film, Double Regular 8 mm film, or simply as Standard-8 or Regular-8, is a film format originally developed by the Eastman Kodak company and released onto the market in 1932. Super 8 (left) and Regular 8 mm (right) film formats. Magnetic sound stripes are shown in gray. The format, initially known as Cine Kodak Eight, was developed by Kodak to provide a cheaper and more portable alternative to the 16 mm film format introduced a decade earlier. Standard 8 mm film stock consists of 16 mm film reperforated to have twice the usual number of perforations along its edges, though using the same size sprocket holes. This film is run through the camera, exposing one edge of the film only (the frame size of standard 8 mm film is 4.8 mm x 3.5 mm). The spool is then reversed and the film run through again, exposing the other edge. After processing the film is cut down the centre and spliced together to give one roll of 8mm wide film. The standard spool size for amateur use contains 25 ft of film, giving a total of 50 ft available for projection; at the usual filming speed of 16 frames per second this gives about four minutes of footage. The format was an immediate success, but retains a number of inherent problems and quirks, mostly connected with the fact that the spool needs to be removed and reversed halfway through filming. This procedure is tricky for the inexperienced user and needs to be carried out in subdued light to avoid fogging of the edges of the film. In addition, the central six feet of the finished film includes a characteristic burst of light corresponding to the reversal point (unless the film is again edited and spliced). In the early 1960s, a new filming and projection standard of 18 frames per second was introduced, although many cameras and projectors included a multi-speed facility. The standard 8 mm format was quickly displaced, for the most part, by the Super 8 mm film format - which offers cartridge loading, a 50% larger frame size and electric-powered cameras - from the mid-1960s onwards. 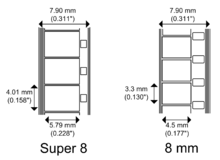 Super 8 was criticized that the film gates in some cheaper Super 8 cameras were plastic, as was the pressure plate built into the cartridge; while the standard 8 cameras had a permanent metal film gate that was regarded as more reliable in keeping the film flat and the image in focus. In reality, this was not the case, since the plastic pressure plate could be moulded to far smaller tolerances than their metal counterparts could be machined. Another criticism of Super 8 was that more sophisticated standard 8 mm cameras permit backwind of the film - difficult but not impossible with a Super 8 cartridge - enabling simple double-exposure and dissolve effects to be made in-camera. Finally, Super 8's smaller sprocket holes, while allowing a larger frame size, were also inherently more liable to tear. The first camera produced was Kodak's own Cine Kodak Eight Model 20. Like many subsequent cameras, it was extremely simple and powered by clockwork. The Swiss company Paillard-Bolex SA introduced its first 8 mm camera in 1938 and its first 'pocket' 8 mm camera aimed squarely at the amateur market, the L-8, in 1942. Bolex cameras and projectors continued to occupy the high end of the market. In the US, Bell and Howell introduced an 8 mm projector in 1934, and in 1935, the Filmo Straight Eight camera, using pre-prepared 8 mm wide film. Standard 8 mm equipment was also manufactured by Carl Zeiss, the Austrian firm Eumig, Fuji (as Fujica), and Canon, amongst others. Eastman Kodak officially discontinued manufacture of the film in 1992. However, private marketed film by a "major U.S. manufacturer" (of which only one company could possibly qualify) has continued until at least late 2011. As of November 2011[update], John Schwind, of International Film, is the only supplier for this "major US company" in the entire world. There are many cameras still in use by film students, hobbyists, and other amateurs worldwide. In the Summer of 2003, John Schwind and Karl Borowski had the distinction of convincing Karen K. Dumont, an employee of this "major manufacturer" to produce the last new variant of type K-14 film stock ever coated, dubbed "Cine Chrome 40A." This was the first new introduction of a type K-14 stock since 1988, a 40-speed, tungsten-balanced film to offset the discontinuation of "Cine Chrome 25," another K-14 product. This film was kept in production until 2006, coinciding with the discontinuation of Kodachrome 40A in that same year. Foma R-100 film also continues to be produced by the European manufacturer Foma. Due to aging punch dies, this film does not have an advantage over Super 8 film in terms of image steadiness. The most commonly used film stocks were produced by Kodak. In particular, the 10 ASA Kodachrome colour reversal stock, with its distinctive colour rendition and fine grain, was closely associated with the format. Kodachrome II, rated at 25 ASA, was introduced in the early 1960s. Kodak continued to produce standard 8 mm film directly up until 1992, although its 16mm stocks are still re-perforated and respooled by other companies. Other film stocks from different manufacturers, such as Agfa's Agfachrome, were also available. Kodachrome's excellent archival qualities mean that old 8mm film can still appear remarkably fresh if stored in the correct conditions. Various attempts were made to simplify use of standard 8mm film over the years, but none was especially successful. The Straight Eight format, using pre-prepared 8mm wide film, had some popularity in Europe, where Agfa manufactured their own stock. Kodak eventually introduced a magazine-loading system, but it was never as popular as spooled 8mm film and was discontinued by the early 1980s. Some manufacturers (e.g. Pentacon in East Germany) made cameras with special magazines that could be pre-loaded with 8 mm spools. They were simply pulled out and flipped in mid-roll, avoiding re-threading the film. Although few cameras were made that could record the sound directly onto the film (Fairchild Cinephonic Eight cameras, Fairchild Professional 900 cameras, and Pictorial cameras), there were many projectors that could record and replay sound on a magnetic stripe. For cameras, this stripe had to be added to the film before it had been exposed. For projectors, the stripe had to be added to the film after it had been processed. The stripe was added between the perforations and the edge of the film (see illustration at head of article). Sometimes a balance stripe was added on the opposite edge. This had no purpose other than to allow the film to be completely flat in front of the projection window. For synchronised sound, the sound was specified as 56 frames in advance of the picture. On the Cinephonic Eight cameras, the picture/sound separation was 52 frames. Fifty six frames was the same physical distance as magnetic sound was specified for the 16mm film format (or 28 frames in that format). Optical sound was never specified as the format had insufficient space for an optical track. Although standard 8 mm was originally intended as a format for creating amateur films, condensed versions of popular cinema releases were available on the format up until the 1970s, for projection at home. These were generally edited to fit onto a 200 ft reel. Many Charlie Chaplin films, and other silent movies were available. The Walt Disney Studio released excerpts from many of their animated feature films, as well as some shorts, in both Standard and Super 8, some even with magnetic sound. New releases of material were not stopped until the late 1970s in the US. ^ "internationalfilm". Archived from the original on 2011-11-27. "sappam - Virtual Museum of HomeMovie Equipment (german)". "Super 8 mm Film History (archived)". Kodak. Archived from the original on 2007-11-12. Retrieved 2009-01-13. "History of sub-35 mm Film Formats & Cameras". ANI-MATO J-E Nystrom. Retrieved 11 November 2007. This page was last edited on 12 October 2018, at 15:26 (UTC).